Two bush fires burn in northern South Australia. Neither fire is a threat to life or property. Yellow fever outbreak in Darfur kills at least 32. Protective measures like the use of bed nets, insect repellent and long clothing are considered the best methods to contain the outbreak. The U.S. Northeast began crawling back to normal on Wednesday after monster storm Sandy crippled transportation, knocked out power for millions and killed at least 45 people in nine states with a massive storm surge and rain that caused epic flooding. Financial markets reopened with New York Mayor Michael Bloomberg ringing the opening bell at the New York Stock Exchange, and packed buses took residents back to work with the subway system halted after seawater flooded its tunnels. John F. Kennedy and Newark airports reopened with limited service after thousands of flights were canceled, leaving travelers stuck for days. New York’s LaGuardia Airport, the third of the airports that serve the nation’s busiest airspace, was flooded and remained closed.It will take days or weeks to recover from the massive power and mass transit outages. Tropical Storm Rosa forms well off Mexico’s Pacific coast, no threat to land. Tens of thousands flee as tropical storm Nilam hits Chennai in south India. Heavy rains bring floods to the area. “Ocean grabbing” or aggressive industrial fishing by foreign fleets is a threat to food security in developing nations where governments should do more to promote local, small-scale fisheries according to a study by the UN. The report said emerging nations should tighten rules for access to their waters by an industrial fleet that is rapidly growing and includes vessels from China, Russia, the European Union, the United States and Japan. Ocean grabbing involved “shady access agreements that harm small-scale fishers, unreported catch, incursions into protected waters, and the diversion of resources away from local populations. Some Pacific islands and African nations receive only between 2 % and 6 % of the value of the fish taken from their waters. Earthquake activity in or near the upper eastern rift zone of Kilauea volcano on Hawaii has been increasing. A magnitude 3 quake occurred in the northern part of the caldera today. Lava flows southeast of Pu`u `O`o continued to be weakly active on the coastal plain. Popocatépetl in Mexico has been decreasing again after rising over the past week. During 27-28 Oct, there was only about 1 emission per hour. A few of them produced small ash plumes. Fuego volcano in Guatemala has a few weak explosions and continues to alimentate the lava flow towards the Ash Canyon which is now about 400 m long. Few weak ash explosions occur from the Santiaguito lava dome and the block lava flows from its summit vent remain weakly active – Guatemala. In the past days Sakurajima volcano in Japan returned to average levels of activity and produced 1-2 mild explosions per day. 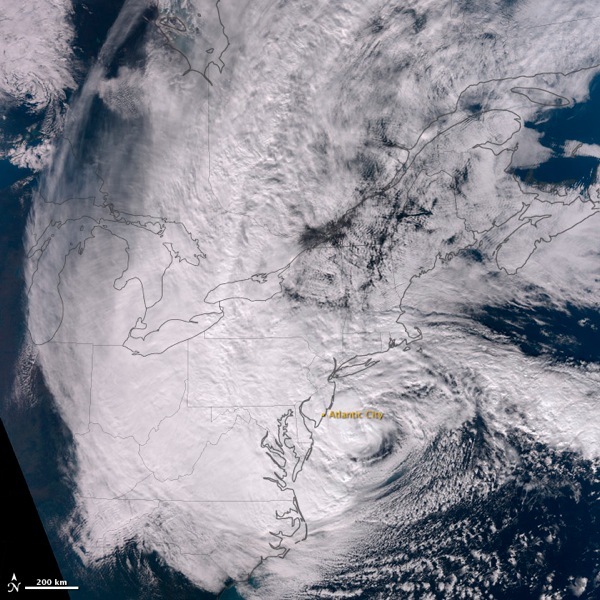 Hurricane Sandy slowed or shut a half-dozen U.S. nuclear power plants, while the nation’s oldest facility declared a rare “alert” after the record storm surge pushed flood waters high enough to endanger a key cooling system. Hurricane Sandy hits the US East Coast, leaving more than 7 million people without power, flooding New York subways, at least three New Jersey towns. At least 18 people dead. 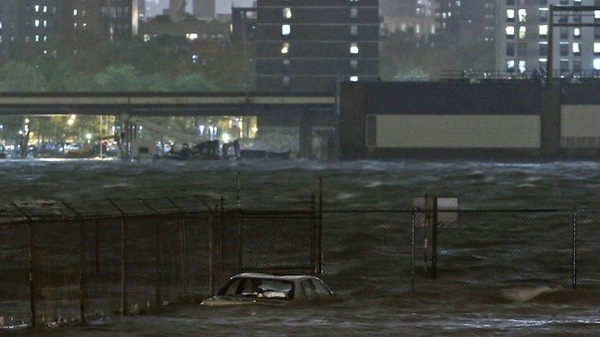 Half of Manhattan underwater. 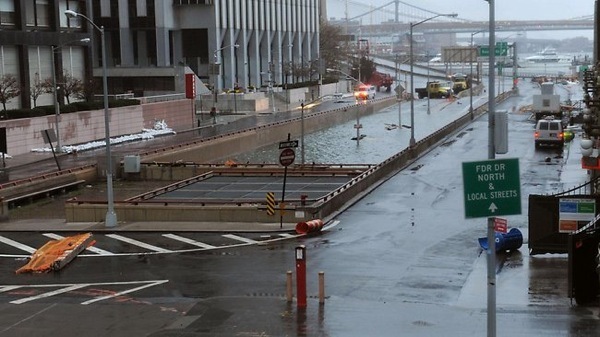 A record 4 metre storm surge was threatening southern Manhattan. 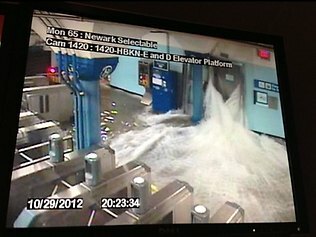 Cars are floating down streets, subway stations and tunnels are filling with water. President Obama signs a declaration of emergency for New York and New Jersey. New York Stock Exchange closes for a second straight day. Fire in Queens destroys 50 homes. Huge devastation in Atlantic City. 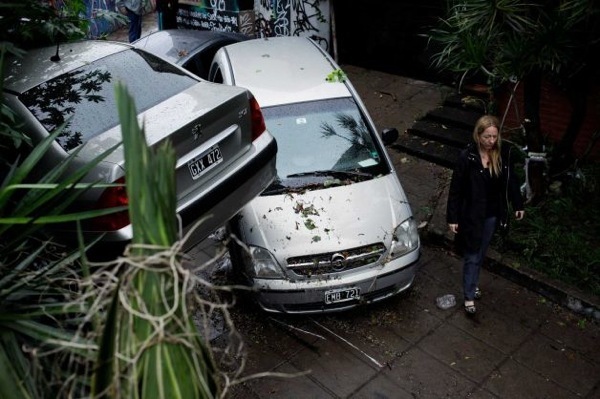 Heavy rains flood Argentina’s capital. Nearly 5 inches (130 millimeters) of rain fell in just a few hours Monday morning, causing power outages, flooding subways and train lines and turning streets into rivers. Tropical Storm Son-Tinh was moving northeast along the northern Vietnamese coast on Monday after tearing the roofs off hundreds of houses and breaching flood defenses overnight and killing at least 30 people. Tropical Cyclone Nilam hits Sri Lanka and South India. A tornado tore through Somerset, Bermuda yesterday morning, damaging buildings and vehicles in a flurry of destruction before drifting off shore. Snow and gales hit France and Switzerland over the weekend. Four people die with 2 still missing. Hurricane Sandy is threatening 60 million Americans in the eastern third of the US with havoc from high winds, drenching rains, extreme tides, storm surges and flooding as the East Coast battens down from Virginia and Massachusetts, including Delaware, New Jersey, the New York City area, Connecticut and Rhode Island. The Arctic Ocean is increasingly becoming the world’s garbage dump, with twice as much plastic trash and other litter covering its seabed compared to 10 years ago. 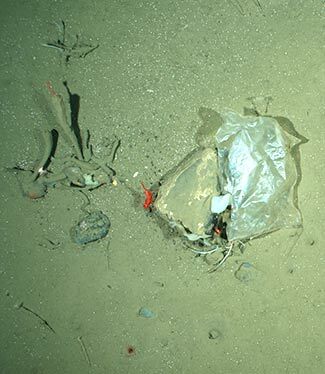 The amount of human refuse seen at the Arctic deep-sea observatory was found to be even greater than in a deep-sea canyon near the Portuguese capital of Lisbon. The outbreak of Marburg virus in Uganda claims its seventh victim. The lava lake at Kilauea volcano on Hawai’i within Halema‘uma‘u crater remains at high levels, although the inflation-deflation cycle has now entered deflation and the lake level has slightly dropped. Elevated earthquake activity continues to appear beneath the upper eastern rift zone. In Mexico, Popocatépetl’s activity has increased again with about 2-3 explosions per hour. Some of these produce ash clouds rising up to 2 km height. An explosion during the night of 25-26 Oct ejected numerous incandescent bombs to the upper outer flanks of the volcano. Fuego volcano in Guatemala has mainly had effusive activity the past days with the lava flow towards the Ash Canyon increasing in length again to now about 600 m.
During 25-26 Oct, Sakurajima volcano in Japan had 2 relatively strong explosions sending ash to more than 3 km altitude (10-11,000 ft). Elevated surface temperatures were detected at Cleveland volcano in the Aleutian Islands, perhaps related to a new phase of lava dome growth. Seismic activity remains elevated at Iliamna and Little Sitkin volcano, but there have not been any other signs of activity recorded. In Kamchatka: Shiveluch volcano’s lava dome continues to grow slowly and explosions could occur any time. According to video data, the volcano is steaming and there is incandescence above the dome. Seismicity is moderate, and satellite data show a thermal anomaly. A hot spot continues to be visible at Karymski volcano, seismicity is moderate and KVERT reports a possible small eruption with ash to 3,000 ft / 4 km altitude yesterday. Moderate seismicity, a visible weak steam plume and a thermal anomaly detectable on satellite data suggest that mild strombolian activity continues in the summit crater of Klyuchevskoi volcano. A thermal anomaly remains visible at Bezymianny although KVERT has not detected seismic activity recently. Activity at Kizimen has decreased over the past weeks, but incandescence, steaming and moderate seismicity continue to be registered, confirming that the lava dome remains active. Alaid volcano in the Northern Kuriles continues to show a thermal hot spot and steaming could be observed from neighboring Paramushir Island. The submarine eruption of Havre Seamount in the Kermandec archipelago discovered 9 Aug has been confirmed by direct observation. NZ scientists used multibeam sonar to map the seamount and found evidence of a new volcanic cone, 240 m tall and reaching withing 1,100 m below sea level, built on the side of the large submarine caldera of Havre volcano. 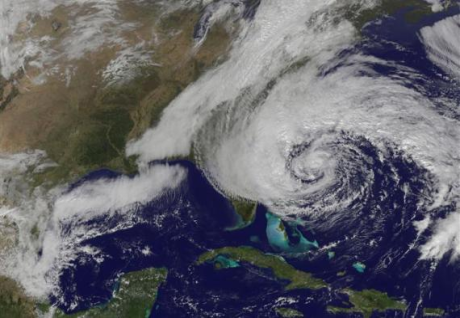 Death toll from Hurricane Sandy in the Caribbean rises to 58. Gale force winds are expected to arrive along portions of the US mid-Atlantic coast by late Sunday and reach Long Island and southern New England by Monday morning. Winds to near hurricane force could reach the mid-Atlantic states by late Monday. At least 24 people have been killed as a result of tropical storm Son-Tinh in the Philippines.